Watch the full interview and then may all 7 billion give it a thumbs down to show the evil ones of the world we won’t give them what they want. 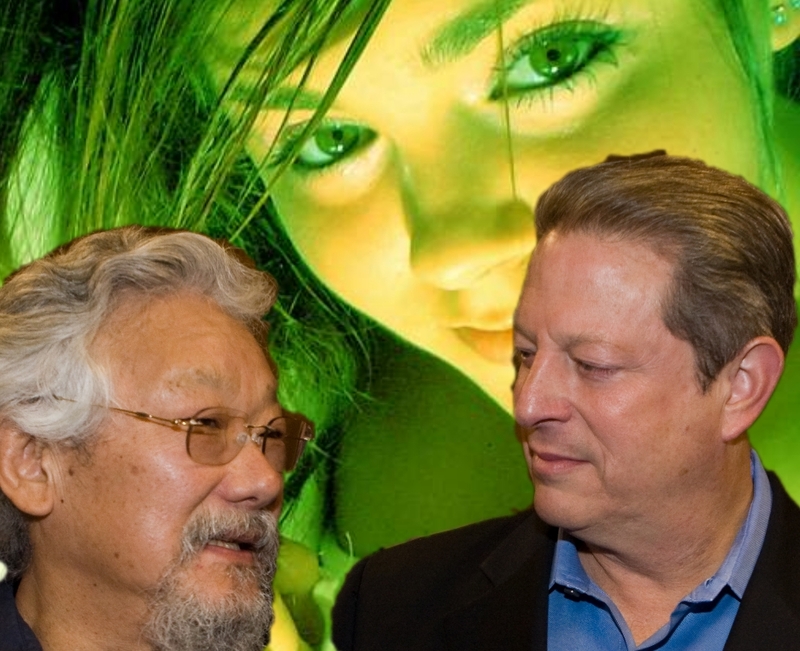 Gore and Suzuki – Child Abusers? 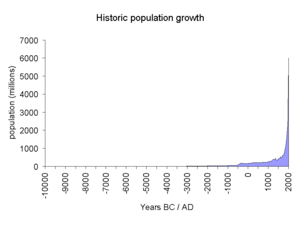 Editor: Notice how the population graph looks the same as the Al Gore hockey stick in his MMGW propaganda movie. Any reduction in C02 will correspond with a planned reduction in human population. Environment and Eugenics are one and the same. We need a smaller U.S. population in order to halt the destruction of our environment, and to make possible the creation of an economy that will be sustainable indefinitely. All efforts to save the environment will ultimately prove futile unless not only halt, but eventually reverse, our population growth so that our population —after an interim period of decrease— can be stabilized at a sustainable level, far below what it is today. We are trying to address our steadily worsening environmental problems with purely technological solutions, while refusing to come to grips with their root cause —overpopulation. Population size —not just population growth— is important because it multiplies and intensifies our overwhelming environmental problems. Sheer numbers of people can prevent the achievement of such vital national goals as a healthy environment and sustainable economy. At any given level of technology and conservation, our impact on the environment is proportional to the size of our population. There is an indisputable correlation between population size and environment degradation. Regardless of new technologies and heroic conservation efforts, we must recognize that population size is the central, core issue and address it as such. By any measure, the United States is already vastly overpopulated. We have long since exceeded the long range carrying capacity of our resources and environment, yet we continue to grow rapidly, by about 25 million each decade. If present rates of immigration and fertility continue, our population, now in excess of 256 [as of April 1998, 269] million, will pass 400 million by the year 2055, with no end to growth in sight! Could any rational person believe that U.S. population growth on such a scale could be anything other than catastrophic for our environment, and our standard of living? Already, with our present numbers, we are poisoning our air and water, destroying croplands and forests, and triggering fundamental climate changes. Asking ourselves the right questions is supremely important, because failure to do so can prove fatal. As a nation we have failed to ask ourselves the essential question regarding a national population policy: At what size should we seek to stabilize U.S. population? Surely that is the central issue. As a direct result of our failure to ask that question —and find an answer to it— we are doing absolutely nothing to first halt, and then reverse, our explosive population growth. The question of an optimum population size for the U.S. is a public policy issue of crucial importance. It is, however, an issue that is completely ignored not only by our policy makers in all branches of the Federal government, but also by the mass media who could, and should, bring it forcefully to the attention of the American public. We at NPG believe that the optimum size for U.S. population lies in the range of 125 to 150 million, or about the size it was in the 1940s. With a slow and gradual decrease in our numbers, that size could be reached in about a century (see Fig. 2 below). To progress toward a smaller population we would need to lower substantially our present rates of immigration and fertility. Those two factors, together with increases in life expectancy, are responsible for our population growth. Our detailed recommendations will be presented later in this paper. For the moment, however, let us examine the concept of optimum population size. Optimum population size should not, of course be confused with maximum population size or the number of people our country could possibly be made to feed, with a low standard of living for everyone, accompanied by the rapid destruction of our ecosystem. If bare levels of subsistence, and the perhaps irreversible destruction of our environment were acceptable, then maximum U.S. population size might exceed optimum size by a factor of five, ten, or even more. Various experts are forever trying to estimate how many people in out nation, and the world, could possibly be made to support. Their focus, for some odd reason, seems to be on the possible rather than the desirable. Critics often claim that the concept of optimum population size is so value-laden that it will be forever impossible to develop a broad consensus on a specific number, or range. We need not be deterred by such objections. Judgments on public policy issues can never be completely value free, nor need they be. For example, is there some magic number for the size of our defense budget, foreign aid, or the Federal discount rate? Of course not. The essential point is that, after all the evidence is carefully weighed, a final figure must be determined as a matter of policy so that the process of government can proceed. The same holds true for optimum population size. We must decide on a figure, or range, for optimum size, or at least decide whether it is smaller or larger than present numbers. Failure to do so condemns us to continues inaction, and makes it virtually impossible to progress beyond vague calls to stabilize population at some unspecified level, at some indefinite date. What we must try to define are the criteria that will guide our search for answers to the question: What is the optimum size at which we should seek to stabilize U.S. population? 1. The primacy of environmental consideration, because our economy, and our very lives, depend on the proper functioning of the earth’s natural ecosystems. 2. The idea of time, duration, and sustainability. An optimum population size would allow the creation of a society, and an economy, that would be sustainable indefinitely. 3. The idea of an adequate standard of living for everyone. 4. Ample room for open space and wilderness, and for other creatures and forms of life. 5. Prudence. Given our incomplete knowledge of the world’s natural ecosystems, and given that the damage we inflict on the ecosystem may be irreversible before we are even ware of it, a large margin of safety should be built into the goal, just as engineers build large margins of safety into the design of a bridge. If, for example, it appeared that the optimum U.S. population could reasonably be set at 200 million, the prudence would dictate reducing the goal by at least 25 percent, in order to ensure an adequate margin of safety. Canadian International Development Agency dropped by for a visit today. What were they reading?? Al Gore and Maurice Strong – Con Artists Extraordinaire! Maurice Strong has done more to destroy the Nation of Canada than any I know of. These next two Gentlemen are working to complete Strong’s goals. Paul Martin, worked for Strong and Stephen Harper our Prime Minister both say “Canadians must give up their sovereignty. This video relays the eco-fascist message well……..Do as we say or else! In the film which contains disturbing images, a teacher invites her class to take part in the environmental campaign. Two children, who do not want to, are asked why. But moments later she presses a button and the children explode into a mess. Similar scenes are played out in an office where four workers are blown up and a football training session where footballer David Ginola, who also says he does not want to do his bit to combat climate change, disappears in an explosion. In the final scene, Gillian Anderson, who provides the voice- over is similarly dispatched after saying she thought doing the voice over was enough of a contribution to the campaign.